New Delhi: Toyota Motor Corp. has agreed to produce Suzuki Motor Corp.’s cars to utilize the idle capacity at its Bengaluru factory, widening the alliance between the two companies in India. The decision was taken after discussions between the two Japanese auto makers, three people familiar with the matter said. Toyota Kirloskar Motor Pvt. 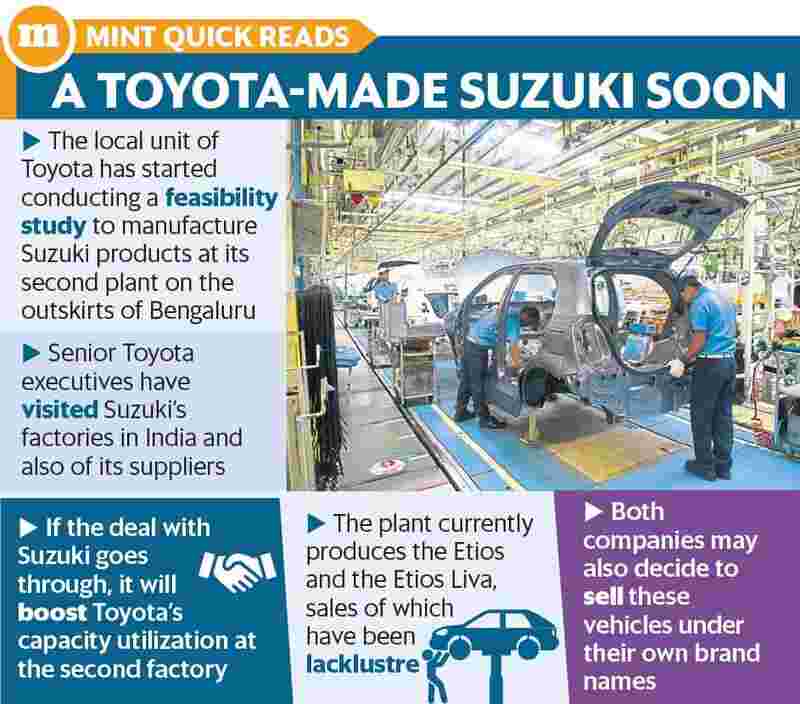 Ltd, the local unit, is currently studying the feasibility of making Suzuki cars at its second factory on the outskirts of Bengaluru, the people cited above said on condition of anonymity. The study would also help decide on the Suzuki models that would be produced by Toyota, the people said. If Toyota goes ahead with the plan, the company will be able to boost capacity utilization at its second factory, said the people cited above. That plant currently produces the Etios Liva and Etios cars, whose sales have remained lacklustre. “The utilization of Toyota’s second plant is very low as the Liva hatchback and Etios sedan are manufactured there. So there is ample free capacity to be utilized," said the first person. Senior executives of both Toyota and Suzuki have visited each other’s factories in the recent past, they said. Executives from Toyota have also visited plants of some of Suzuki’s major suppliers in India for quality checks, the people said. “Some senior executives from Toyota visited Suzuki’s Gujarat and other manufacturing capacities to do a feasibility study and some of them also visited the facility of the suppliers," said the first person cited above. “They tried to check whether some of the vendors could match the quality standards of Toyota." A deal would be an expansion of an agreement unveiled by Toyota and Suzuki in March to sell each other’s vehicles in India through a cross-badging arrangement. That tie-up entailed Suzuki supplying the Baleno premium hatchback and Vitara Brezza sport-utility vehicle to Toyota. In return, Toyota would supply its Corolla sedan to Suzuki. The cars would be sold by Toyota and Suzuki under their own brand names through their individual dealership networks. With a 5.07% share of the 3.2 million units passenger vehicle market in India, Toyota lags far behind Maruti Suzuki’s commanding 51.43% marketshare. The second person cited above said although the vehicles will be made by Toyota, Suzuki will be involved in some capacity. Both companies may also decide to sell these vehicles under their own brand names, the person said. As part of the partnership announced in March, Toyota and Suzuki would also develop electric and hybrid vehicles for the Indian market. Maruti Suzuki India Ltd did not respond to queries sent by email. “You may kindly refer to the official announcement of March and May 2018 on Toyota and Suzuki mutual supply of vehicles and on joint project for technological development, vehicle production and market development as available in public domain. Further details are under discussion," Atsushi Oki, vice president of Toyota Kirloskar Motor, said by email. A senior executive at one of the auto makers, one of the three cited above, said one of the main objectives of this arrangement is to improve Toyota’s capacity utilization. The executive declined to disclose the cars that will be manufactured by Toyota. Mint could not independently verify which of the two companies will make the investments in Toyota’s factory to produce Suzuki vehicles, and whether the cars would be sold only in the local market or exported. “It’s a win-win situation for both Toyota and Suzuki as this will solve problems for both. Toyota will get access to Suzuki’s successful products and suppliers in India and improve the capacity utilization of its plants. Suzuki on the other hand will get the technology needed to sustain in future," said Puneet Gupta, associate director, vehicle sales forecasting at IHS Markit. Mint on 6 August reported that Suzuki is likely to supply around 20,000-25,000 units of the Baleno premium hatchback each year to Toyota starting from the next fiscal year as the car will become the first cross-badged product of the auto makers.